As per Technavio, the advent of environment-friendly sports equipment will have a positive impact on the market and contribute to its growth significantly over the forecast period. 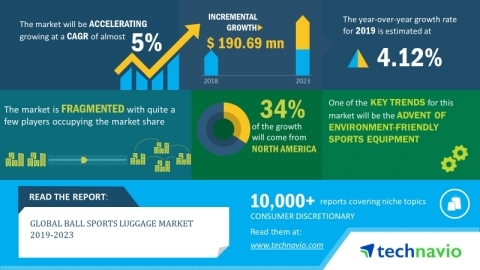 This global ball sports luggage market 2019-2023research report also analyzes other important trends and market drivers that will affect market growth over 2019-2023. "Vendors in the market, such as Nike, adidas, and Under Armour, are using innovative materials to make ball sports luggage. This is mainly to cater to the rising demand for premium products from high-end consumers. Vendors are also focusing on pricing strategies to optimize their bottom lines with an effective profit margin strategy," says a senior research analyst at Technavio.